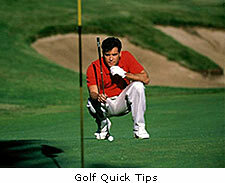 Many golfers have the impression that the head needs to stay fixed and down throughout the golf swing. This is a common misconception that keeps a lot of players from not reaching there potential and improving their golf swing. If you have the opportunity to watch a tour pro swing the golf club you will notice two things about what the head does in the golf swing. 1. There is some lateral movement to the right on the backswing. 2. The head releases up and to the left immediately after impact. How will this help the average player increase their power? 1. The movement of the head in the backswing allows the upper body to properly coil over the lower body. 2. Proper releasing of the head on the after impact will give the body the freedom to rotate through to a full finish. 3. These two things will help establish correct weight transfer and will maximize power in your golf swing. By allowing your head to move, you will allow your body and arms to move freely and efficiently which will help to increase your distance. can anyone give me tips on how not to slice the ball????? STAY BEHING THE BALL AT IMPACT. BE SURE YOUR DOMINATE HAND IS ON TOP OF THE SHAFT ON FOLLOW THROUGH. tour pros do move their head slightly on the backswing, but by the time they return the club to the ball on the downswing, their head moves back to the exact pos when they set up. i seem to have trouble keeping my eyes on the ball do you have any tips to help me? I have a problem with my head dipping into the ball on my backswing. Any tips?